Veteran foreign volunteers who fought in the War of Independence held a stirring meeting Wednesday with present-day volunteers in the IDF. Some 250 Mahal veterans gathered as they do every year in a pine forest at the Sha'ar Hagai memorial for 119 of their comrades who fell 57 years ago. They shared sandwiches and swapped war stories as they do every year. Some brought their children and grandchildren; others made the trip from abroad. The gathering has become the traditional day to recollect their deeds and relive the adventure of leaving their families back in 1948 for Palestine to fight for the independence of the Jewish nation. All told, about 3,500 volunteers, Jews and non-Jews, came from 43 countries. They became known as Mahal, which is the Hebrew acronym for Mitnadvei Hutz La'aretz, volunteers from outside of Israel. This year, they came face to face with some of the modern-day foreign volunteers. For the first time, the IDF dispatched an honor guard for the memorial service. And the army chose, of course, to send a dozen foreign volunteers currently serving in the army. Dressed in clean "Alef" uniforms of the Nahal Brigade, a dozen young men obeyed the orders called out by Mahal veteran Col. (ret.) David Teperson, 79, a towering man with a pistol in his belt who came from South Africa as a Mahal fighter in 1948. When they broke up after the ceremony the veterans eagerly sought them out for photographs and stories. Some chatted in English, others in French. While the volunteers of 1948 were mainly veterans of World War II or had skills the nascent IDF needed, the volunteers today are young Jewish men just out of high school with only their brawn and spirit to offer. "I always wanted to join the Marines since I was a kid," said Pvt. Avraham Bilgoray, 19, from Brooklyn. "I used to see films and wanted to be a marine. I had already done the physical and signed papers. Then a friend of mine told me about Mahal. He gave me a telephone number to call. I called them up and they took care of everything, so here I am," he said, slinging his M-16 assault rifle over his shoulder. Today there are some 115 foreigners volunteering in the IDF. In contrast to new immigrants who serve, these volunteers sign up for only 14 and a half months. Nearly all are in combat units. A third are from English-speaking countries, a third from France and a third from the rest of the Diaspora. They do not receive citizenship, but are given temporary-resident status. Ask Pvt. Joshua Gross from Houston, Texas, how long it he has been in the country and he says without hesitation, "In 17 days it'll be a year." But who's counting? A silver Magen David dangling from his neck visible through his open uniform, his participation in the honor guard is a welcome respite from the drills of basic training, where he has been for the past six weeks. Gross, 20, came on a birthright israel program and was enchanted with the country. He remained here, living with an aunt, and searched for a program. He considered yeshiva or a kibbutz. "I was restless and I couldn't just sit down and study Torah," he said. He looked into the eight-week Marva program in the IDF for tourists. "It didn't seem like enough time. I then heard about Mahal and chose that," he said. He was sent to a three-month Hebrew ulpan course in the IDF and is six weeks into his basic training. "I want to be a sniper and will want to extend my time in the army," the Texan said. South African Justin Melman said he volunteered for the IDF Mahal instead of immigrating and serving three full years because of family obligations. "My father told me that I had to return home to Johannesburg to enroll in university," Melman said. Not all knew Hebrew when they arrived, but found the IDF was the best language school. "I came here not knowing a word of Hebrew. The Israeli soldiers have so much respect for us. They try to spread us out so we learn Hebrew," said Bilgoray. The Mahal veterans of 1948 had a major impact on the fledgling IDF. Many of them stayed on in Israel. The phenomenon of foreign volunteers waned, only to be revived during the periodic wars. In 2000, the program was revitalized to encourage the contribution from abroad. 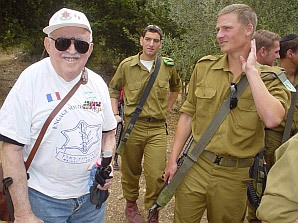 Avi Naor, the chairman of Mahal 2000, said he gets scores of requests from non-Jews around the world to volunteer for the Israeli army. But the IDF policy is only to accept Jews out of the fear that it would otherwise appear mercenary. Even though they are not citizens, present-day Mahal veterans are treated as regular soldiers. They also have the same obligations and dilemmas. "Most of us who come to do the army feel an obligation to Israel. We don't have to do the army. I was accepted to NYU [New York University]. I want to go back and finish my college degree. In New York, everyone goes to college when they are 18, but here I am doing 14 months of service in the IDF," Bilgoray said. He has served seven months, including basic combat and some advanced training. His unit is headed for patrols near Bethlehem. Later he will participate in the disengagement from Gush Katif. "In August we are headed for Gush Katif, which is something I really don't want to do. I feel very awkward. I came to Israel to help the Jews and now I have to throw them out of their houses," he said. "Let's hope it brings peace."